This 18' Single Lane Slide, is a standout ride with an eye-catching color pattern. At 18 feet, it stands as a relatively tall slide with an 11 foot tall slide platform angled at 40 degrees for tons of sliding fun. The 18' Single Lane Slide allows riders to climb up and enjoy the slide without worry or safety. 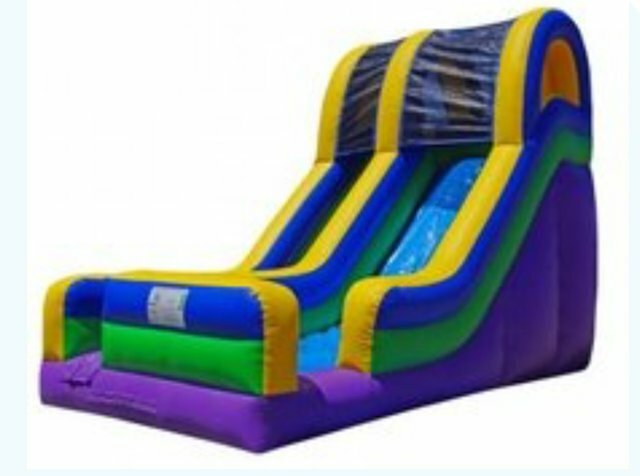 This slide is an upgrade in safety from other slides as it includes an inflated safety bumper at the end of the slide along with a netted top and high side walls. This unit must be set up on grass if outside.